The Richelieu collection is an innovator in craftsmanship design and style. Our trendy collection of decorative hardware is a reflection of our continuing interest in bringing you the latest selection of high-quality and innovative products. These unique products will bring together functionality, aesthetics, ergonomics, in all kinds of styles and finishes. Contemporary round knob by Richelieu. With its slightly domed face and ribbed edge on a cylindrical post, this product is perfect for furniture and cabinets with simple straight lines. Classic polyester knob by Richelieu. The knob features a teapot shape that will enliven your furniture and cabinets. This Richelieu metal knob will add a touch of elegance to your kitchen or bathroom dicor. Simple lines with elegant details make this a classic. This classic metal knob consists of a flattened sphere circled by an elegant twisted rope motif. The perfect accent for your kitchen and bathroom cabinets. Contemporary Metal Knob 1 3/16 in (30 mm) Dia - Brushed Nickel - Copperfield Collection The Richelieu collection is an innovator in craftsmanship design and style. Our trendy collection of decorative hardware is a reflection of our continuing interest in bringing you the latest selection of high-quality and innovative products. These unique products will bring together functionality, aesthetics, ergonomics, in all kinds of styles and finishes. 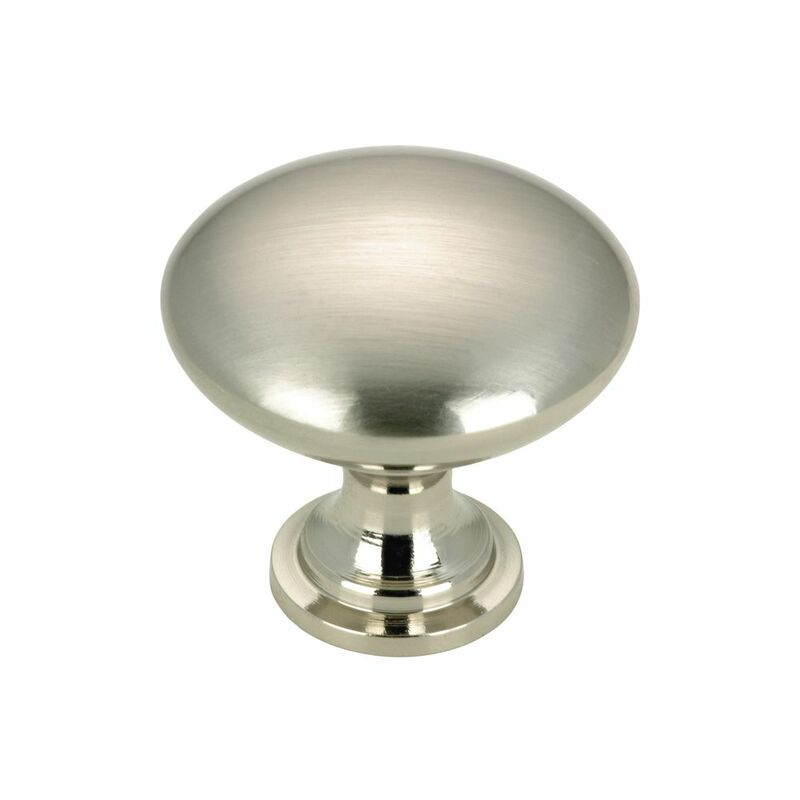 Contemporary Metal Knob 1 3/16 in (30 mm) Dia - Brushed Nickel - Copperfield Collection is rated 4.7 out of 5 by 6. Rated 5 out of 5 by Barbara from The knobs were exactly what I was looking for! Easy... The knobs were exactly what I was looking for! Easy to put on and a perfect fit! Rated 4 out of 5 by BigJoe from Attractive cabinet knobs Would be an excellent rating except that some knobs were stripped and screws didn't fit. Suggest you order 2 or 3 extra knobs and understand you might have to go to hardware store to buy a few screws. Rated 5 out of 5 by KLo1984 from Great product, great delivery time I'm very pleased with this product and the time it took to be delivered. Free shipping a huge plus! Rated 4 out of 5 by RichiesMom from Nice looking This is just a plain brushed nickel knob. I wanted an "egg" shaped knob but my cabinet installer said I would hate them be cause they would turn and look like they were not installed correctly. I took his advise and got these. They do look very nice. I bought about 20 knobs and two had bad threads and could not be used. I really dont expect a problem returning the bad ones.